Performing his one-man show this June in the Hollywood Fringe Festival, George Steeves ’12 was not just trying to make an acting and singing career happen. Magic 8 Ball: My Life with Asperger’s, the show, started out as a song Steeves wrote at Cal Lutheran. The fortune-telling black ball, with its unpredictable shuffle of answers, became his symbol for emotional states: “I can be one thing one day, and completely opposite the next day,” he says. 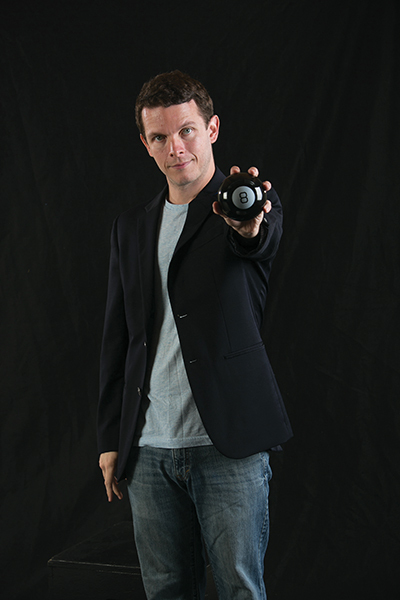 In the one-man show, the eight ball leads the audience through the story of his life on the autism spectrum. After moving from small-town Virginia to Philadelphia at age 11, the high-functioning Steeves spent two years in a special education class among children with severe learning difficulties, a poor fit. Until that year he’d not been diagnosed and had never been led to believe he was different. The sudden sense of not belonging hurt. Now Steeves embraces the autism spectrum and performs with others on it in mind. He’s even returned to his Philly special ed class as a guest to teach drama, after writing an original play about the solar system for the students. Hear Steeves sing “Magic 8 Ball (That’s My Life)” and view his recent work for the mental health website The Mighty.